Quick Take: Very solid coffee beer that is let down by the thin mouth feel. If you are looking for a near sessionable stout that has some of the best coffee flavor I have had in a beer for a very reasonable price, this is it. It should be noted that I am a coffee lay person with little to no coffee swigging experience. Brew Facts: Starr Hill Brewery is located in the Blue Mountain area of Virginia, just outside of Staunton VA, home of the American Shakespeare Center. 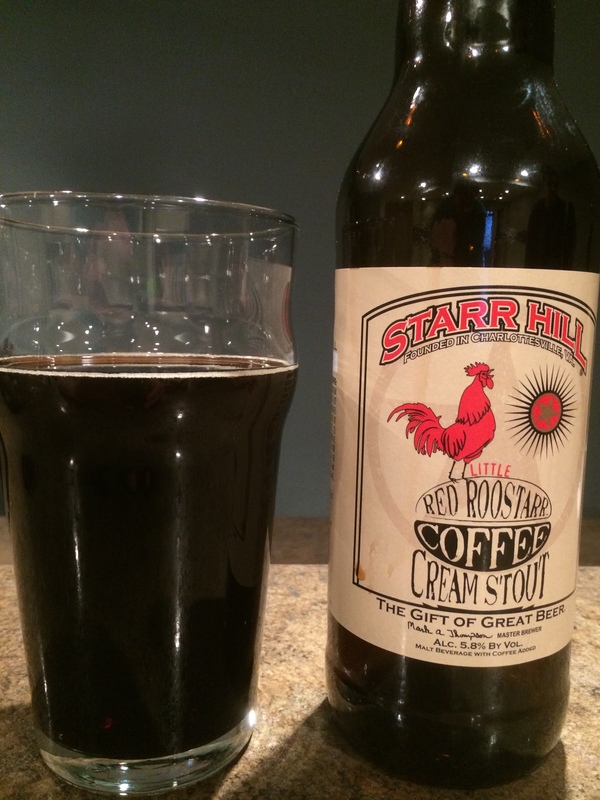 The coffee for this crème stout was supplied by Red Rooster Coffee Roasters in Floyd, VA. Appearance: Definitely not coffee black, but more a dark brown/raisin color. A tan head quickly disappears in an effervescent display of fizzy bubbles. Swirling it causes small bubbles to cling around the edges. Yup, looks like a stout. Aroma: Coffee, black, a bit of roast, and that’s about it. Try as I might, not a single other element comes through. No matter how warm the beer gets, no matter how deeply I inhale, coffee and roast. That said, it’s a really pleasant, rich coffee aroma that isn’t harsh or bitter. Taste/Mouth Feel: On first drink, I could only focus on the thin body and so dry did I actually drink this finish. Given the big coffee aroma, my mind was ready for a robust, creamy, full bodied stout. Apparently in the time it took to look at the bottle and take in the beer, I forgot that this is not an imperial beer. Balling up my expectations and chucking them into the recycling bin, my next sip found a blast of coffee along with some roast and sweet malt/molasses. The coffee is on the espresso side due to the lactose/milk quality and dominates this beer like a Colombian drug lord. Finish is a watery, thin roast disappoint. Really, I just want this to be bigger and thicker…you heard me. Any amount of supposed chocolate and caramel is so far in the background as to make it merely a whisper. Final Thoughts: Very solid coffee beer that is let down by the thin mouth feel. I really wanted a rich body to go along with that rich coffee. Clearly, that’s not the intention with this beer. By no means is this a balanced beer, but that is to its coffee roasted benefit. It is a stout with a singular focus that lacks depth, but is very drinkable. If you are looking for a near sessionable stout that has some of the best coffee flavor I have had in a beer for a very reasonable price, this is it. It should be noted that I am a coffee lay person with little to no coffee swigging experience. Second thoughts (Chris): As a coffee drinker, I found this to be fizzy beer coffee. Mouth feel kills this and needs some richness. The coffee aspect is mad good and a beer I’d drink again.